A favorite photo from my early years in China was taken at a Taoist temple in Henan province in 1984. I snapped the photo of an old Taoist priest, perhaps recently released from prison, burning incense. 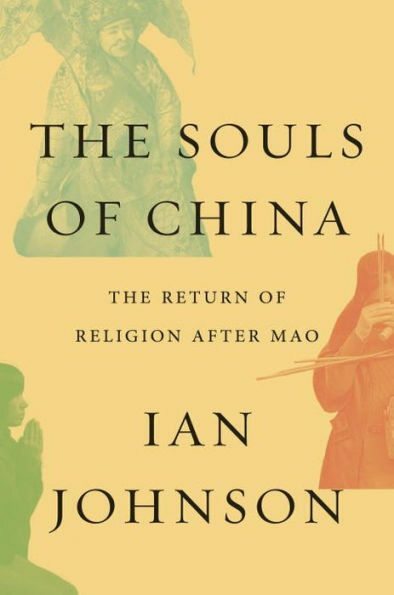 I didn’t know it at the time, but I was witnessing the beginning of the religious revival that Ian Johnson writes about in his wonderful new book,The Souls of China: The Return of Religion After Mao. Johnson—a Pulitzer Prize-winning journalist and regular contributor to The New York Review of Books and The New York Times—spent six years traveling around China learning about Buddhist, Taoist, and Protestant communities of faith. He tells their stories, and out of these stories emerge several themes that help us better understand religion in China today. When the Communist Party—under Chairman Mao Zedong (1893–1976)—took power in 1949, it initially allowed for the continuation of religious belief and practice. The advent of the Cultural Revolution in 1966 brought that allowance to an end: the party sought to drive religion out of Chinese society. All temples, mosques, and churches were closed, and an era of severe religious persecution began. A few years after Mao’s death, the new leader, Deng Xiaoping (1904–1997), launched the “Reform and Opening Policy” that turned China away from the excesses of Mao’s rule to a more pragmatic focus on economic and social development. This policy, detailed in what we know as Document 19, set the stage for the religious revival Johnson describes. Document 19 is commonly viewed as a negative and limiting document since it contains many restrictions. By reminding us of the historical context, Johnson helps us see that it opened the door for the return of religion to Chinese society. “Document 19,” he writes, “was an outstandingly candid analysis of China’s religious crisis and the legal basis for China’s religious revival” (27). It spelled out the party’s long-term policy of “respect for and protection of the freedom of religious belief” (28). The role of religion in China can be confusing, especially for Westerners who often see the world in black and white. The complexity Johnson describes includes a Taoist priest who travels the world, and the pastor of a public and thriving “underground” church. We see an officially atheist government that embraces and promotes traditional values, most of which are rooted in traditional religious beliefs. The government jettisoned one set of moral standards (Confucianism) for another (Marxism-Leninism-Mao Zedong hought), then jettisoned that one without replacing it with anything other than economic development, creating a moral and spiritual vacuum. Now, instead of trying to smash religious belief, the party is trying to co-opt it by focusing on traditional values. Pantheon (2017). 480 pp. $30. By introducing us to Early Rain Church and its pastor Wang Yi, Johnson provides a fascinating glimpse into the inner workings of a large, unregistered urban church that, like thousands of churches around China, is “not permitted but not banned.” How can an “underground church” be public? How can an “illegal” church be “free”? Anyone seeking to understand religion in China must grapple with this complexity. Chinese religious life is extremely diverse. Johnson’s stories of priests, pilgrims, and pastors give us a glimpse of that diversity. We meet Taoist priests who perform funeral rituals, Buddhists who make annual pilgrimages to temples, and Reformed and Charismatic Protestants who grapple with the re-emergence of denominational lines. But China’s religious landscape is even more diverse than the book portrays, since Johnson doesn’t tell the stories of Catholic and Muslim communities of faith. The government’s attitude toward religious belief is one of tolerance. It may be tempting to read Johnson’s stories and see a measure of religious freedom, and when compared to the policies of the 1960s and 1970s that is certainly a fair read. However, this is not religious freedom as many in the West would think of it. It is, rather, a pragmatic (and reluctant) tolerance based on the government’s current belief that religion can be a useful tool in advancing its own interests of harmony, social stability, and Chinese cultural values. For most people outside of China, the dominant narrative of the house-church movement is one of persecution. Johnson reminds us that it’s vastly more complicated and that even these so-called underground churches are tolerated. “These unregistered churches,” he writes, “make up about half of China’s 50 [million] to 60 million Protestants, forming one of those gray areas that defines much of religious life in China” (56). Their visibility notwithstanding, Pastor Wang and the other Christians whom Johnson writes about live with the knowledge that continued government tolerance isn’t guaranteed. As Johnson says, “They operate in a parallel realm outside the Party’s control.” How long that tolerance will continue is the great unknown. In the afterword, Johnson turns to the question of whether this trend of tolerance will continue. While he doubts the state will yield control of the country’s moral life, he also doubts the government will make another attempt at eradicating religion from Chinese society. The challenge will be to keep “a balance of managing religion without alienating its followers” (398). For anyone interested in looking beyond the headlines to understand the complexity of religious life in China today, The Souls of China is a must-read. Editors’ note: Would you join us in resourcing thousands of church leaders in China with gospel-centered resources? All gifts to our Chinese Outreach will be matched (up to $40,000). Learn more about this exciting Theological Famine Relief opportunity. Joann Pittman is a senior associate at ChinaSource, a resource ministry dedicated to providing the global Christian community with objective information about the church in China. In addition, she does consulting and training to help people prepare for and navigate the challenges of cross-cultural living. She lived in China for more than 20 years, working as a teacher, Chinese language program director, English language program director, and cross-cultural trainer. She has done extensive study and research in Chinese language, history, and contemporary society, and is a fluent speaker of Mandarin Chinese. She is the author of She is the author of The Bells Are Not Silent: Stories of Church Bells in China and Survival Chinese Lessons. You can read Joann’s blog Outside-In at joannpittman.com. You can also follow her on Twitter.